Not all customers prioritize these things the same way. We look at turnaround time and the cost of repairs as one in the same. The longer a Medium Duty Vehicle, Truck or Trailer is in the body shop, the more money it is costing you. We specialize in fiberglass and all body repairs. 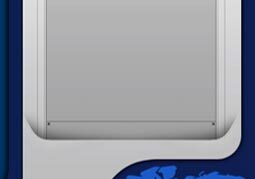 We complete work on weekends and holidays by appointment provided parts are available. This permits us to get the job done faster than anyone else which gets you back on the road doing what you do best, serving your customers and making money. 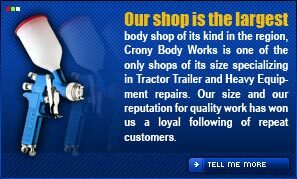 If you are tired of losing your Medium Duty Vehicle, Truck or Trailer for weeks after an accident, let Crony Body Works get you going again. Crony Body Works handles everything from large fleet accounts to small independents. We also deal with all insurance carriers and appraisers.